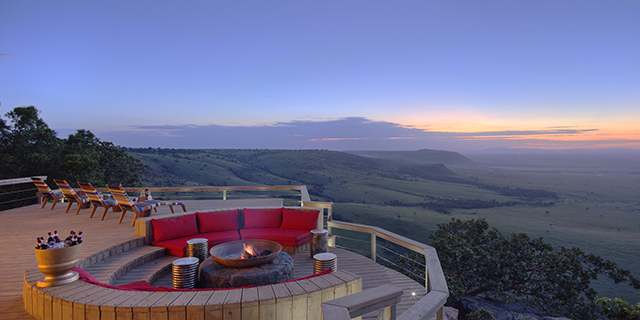 Angama Mara occupies one of the most spectacular locations in all of Africa, set high atop the Great Rift Valley overlooking the endless plains of the wildlife-rich Maasai Mara National Reserve. The beauty of the setting is perfectly complemented by the elegance and luxury of the lodge, making for one of the continent's most romantic safari experiences. 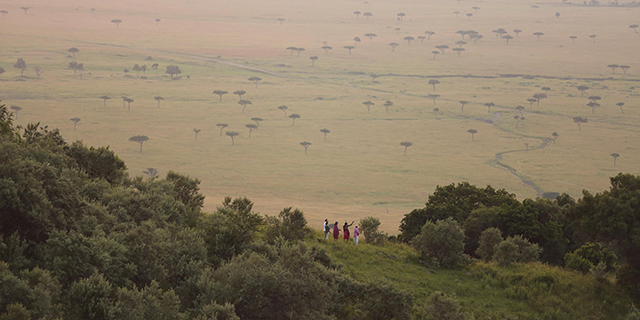 The setting and wildlife are classic "Out of Africa" - in fact, many of the famous film's most memorable scenes were filmed at the Angama Mara site. 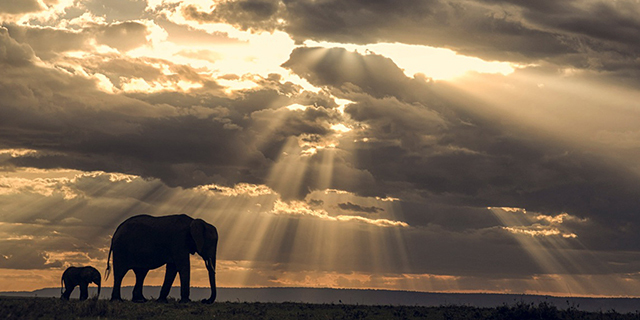 Vast grasslands host an extraordinary abundance of wildlife (including the Big Five), particularly when the Great Migration takes residence from June through October. The wide, meandering Mara River provides a year-round source of water, and a dramatic obstacle that two million herbivores must cross on their deadly journey in search of fresh grazing. Angama Mara is privileged to have a private track directly into the Reserve, providing convenient access to the more exclusive and better managed Mara Triangle portion of the Maasai Mara. Game drives are flexible, based around guest preferences with respect to timing, duration, and focus. The sheer abundance of wildlife takes away some of the pressure to be constantly on safari searching for game. 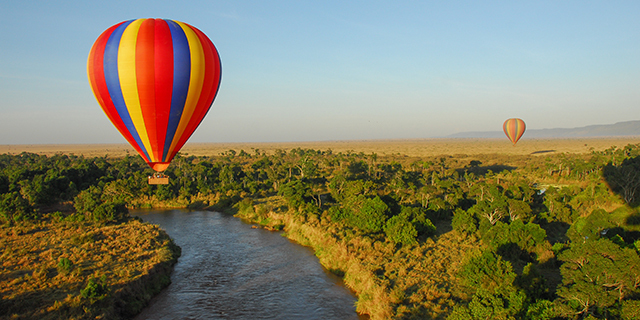 Guests also have the opportunity to enjoy a spectacular sunrise balloon safari over the plains of the Maasai Mara, or to stroll along the rim of the Great Rift Valley on a walking safari guided by a Maasai naturalist. Complement the wildlife experience with a visit to a local Maasai manyatta (homestead) where you will gain an authentic insight into Maasai culture, and the delicate balance they strike between preserving their traditional lifestyle and adjusting to a rapidly changing, global world. Angama Mara’s architecturally dramatic guest areas were inspired by Nairobi’s Muthaiga Club, built in 1917 and famously featured in the movie Out of Africa. Typical of early colonial design in Africa, the inside of the guest areas become the outside and vice versa. On lovely Mara days, all the action will be on the deck and during those dramatic but brief afternoon thunderstorms, guests are safely tucked behind the floor to ceiling glass doors watching the spectacle unfold. By night, the softly-lit architecture of the Maasai brick walls and the cone-shaped buildings that float on a lily pond hold guests’ attention. The Pavilion is the only common shared area and sits in the heart of the lodge between the two camps. With endless views of the Mara and easily reached by footpath from both camps, here guests will find the fitness room, heated solar pool, and Safari Shop. 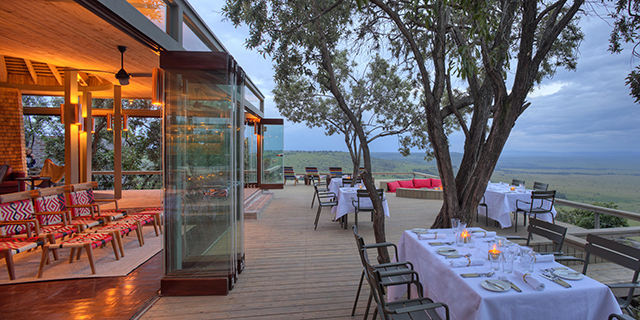 Angama Mara’s elegant and classical tented suites were designed with an 11-metre wide floor-to-ceiling glass front. Each tent has the same breathtaking view – no one is better than the last – and every day, the sunrise provides guests with early morning theatre as the hot air balloons float gently by. Highly polished parquet floors, distinctive splashes of Maasai red, a handsome drinks cabinet (with personal bar and safe tactfully tucked away), vanity with double basins, separate w/c, writing desk with ample charging points and tablet with guest information, WiFi, Africology guest amenities, a collection of East African books, a beautiful John Vogel woven screen, and a butler’s lobby allowing for the discreet delivery of early morning tea and coffee, all add to the comfort and delight of guests in their suites. Angama Mara makes a bold statement of safari elegance and refinement, offering discerning travelers a 21st Century "Out of Africa" experience. The location, the lodge, and the incredible wildlife collude to create the sublime senstation of being "somewhere between heaven and earth".